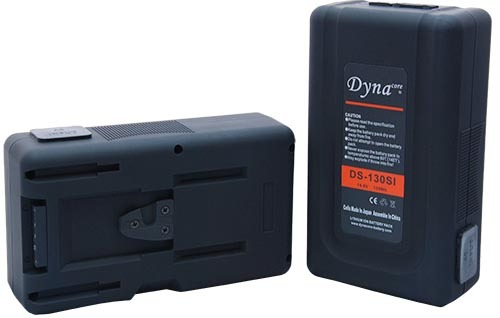 Dynacore Internal Charger Battery V-Mount. 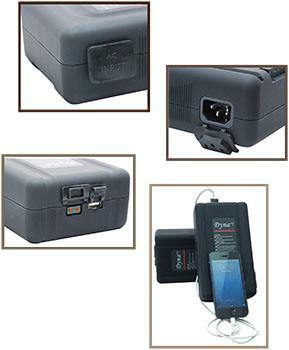 Light weight, compact, high performance Lithium-ion battery pack. Can be charged by itself without using external charger. LED indicator will light on from 1 LED to 5 LEDs during charging, and all off when fully charged..
Five-step LED power status indicator shows accurately remaining battery capacity. Industry standard Power Tap& USB output(5V, 1A) can fit to On-board Camera Light and other accessories.Before using the USB output, long press the LED check button for 3 seconds to activate it.. Input Voltage AC90V~240V 50~60Hz, apply to the global power grid..
Built-in intelligent IC circuit control, protection for over-charge, over-discharge, over current, outside circuit short and non-equilibrium in unconventional situation..
Environment-friendly: No poisonous elements such as hydragyrum and cadmium, ect..
Dynacore Batteries are manufactured according to CE,ROHS standard.